Hale Leys United ended their 2015/16 campaign on a high note when they clinched the South Midlands League Division Two Cup for the second successive season. 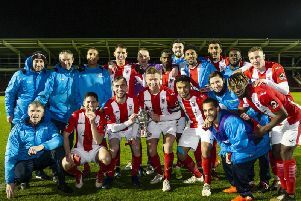 After back-to-back league titles, Hale could only finish second in Division Two this time around, with Kent Athletic crowned champions, but they had some silverware to show for their efforts thanks to a3-2 win over Totternhoe. The final scoreline suggests this was a tight game but Hale were worthy winners as they came flying out of the traps and put Totternhoe under early pressure. Both Anthony Kew and Niall Williams supplied striker and captain Daniel Parsons with plenty of quality and he profited from that on just nine minutes when putting Hale ahead with a clinical finish. The skipper struck again just after the half-hour mark with another sublime finish before the post denied him a first-half hat-trick. Nevertheless, United were in control and leading 2-0 at half-time and though Totternhoe nicked one back early in the second-half, they continued to dominate. Their dominance was rewarded 12 minutes from time when Sean Coles hammered home a third goal and that ensured Hale would be celebrating at full-time despite a fine free-kick making it 3-2. Hale Leys chairman Roger Simmons said: “It’s been another remarkable year again as we have been in contention for the league title and now have won the cup which is a great way to finish the season. Hale’s end of season presentation will be held Saturday, May 21, at 7pm. For all wishing to attend please email the club haleleysunitedfc@gmail.com.